A set designed to keep your skin soft and hydrated throughout the day, this Natural Grooming Mega Moisturiser kit from Bulldog is a must have for any image conscious man. With a trio of different moisturisers, you'll never have to suffer from dry skin again. Including an anti-ageing moisturiser that works to combat the signs of ageing, this set will give you a radiant, healthy glow. This Natural Skincare Original Moisturiser by Bulldog is an all natural moisturiser free of harmful chemicals, and is gentle enough to use both morning and night. Help nourish and hydrate your skin with the use of this ingenious moisturiser. This Natural Skincare Sensitive Moisturiser by Bulldog is an all natural skincare product that's designed to nourish and hydrate your skin. 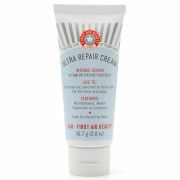 Suitable to use on even the most sensitive of skin, this moisturiser is gentle enough to use both morning and night. This Natural Skincare Anti-Ageing Moisturiser by Bulldog is an all natural skincare product that's designed to help rejuvenate your skin. This moisturiser helps hydrate and enrich your skin, leaving it looking smooth and more youthful. Use these Skincare moisturisers day and night to achieve a hydrated, healthy complexion. With three different formulas that cater for all skin types, you're sure to have silky soft skin in no time.